Tokyo, September 26, 2012 - Fuji Heavy Industries Ltd. (FHI), the maker of Subaru automobiles, today announced the outline of its exhibition at the Japan International Aerospace Exhibition 2012 (JA2012), which will be held by the Society of Japan Aerospace Companies (SJAC) at Port Messe Nagoya and the Centrair, Central Japan International Airport, from October 9th through 14th. As FHI Aerospace Company is aiming to become a “Global Key Player” in the world aerospace industry with its advanced technologies, FHI themed its exhibition “Creating New-Value Products and Markets with Superior Quality for Customers’ Confidence”. It is also in accordance with FHI’s guiding principle for the Mid-term Management Plan “Confidence in Motion”. JA2012 Booth Image of Fuji Heavy Industries Ltd.
FHI exhibits a 1/10-scaled see-through model of Boeing 787 center wing section, which FHI has been participating in designing and manufacturing at Handa Plant (Handa City, Aichi Prefecture). The see-through model shows location and structure of the center wing section in a plane and explaining its structural importance as jointing the fuselage and the wing. In addition to the model, a floor area identified with a unique color in the FHI booth shows actual size of the center wing section. FHI exhibits manufacturing technologies of composite aircraft parts in each process of forming, laying-up, inspecting, drilling, cutting and assembling with panels, videos, FHI original machines and tools and sample products. 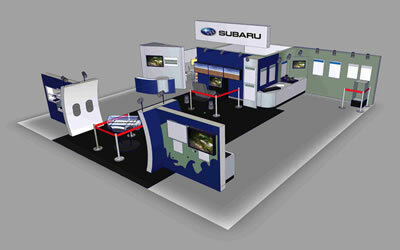 These JA2012 Booth Image of Fuji Heavy Industries Ltd. technologies support FHI’s excellent quality, cost and delivery capability. The flight demonstration conducted by FHI and University of Tokyo last year will be shown in a display panel. The system can reduce pilot workload by communicating between pilot and automatic flight control devices through control sticks. The system will be demonstrated with a flight simulator in the booth. A test piece of the SHM system will be exhibited. The system can detect aircraft structural damage on-demand with sensors integrated in aircraft structures.